British Columbia’s coastline – where I live – is abundantly blessed by a multitude of seafood species that, anywhere else on planet Earth, would cost a fortune. Though I am no fisherman, I thank God for putting candy-cane-legged spot prawns, cream-fleshed oysters, and defensive dungenesses on my table. I quite friendly towards cows, boars, and fowl, I really am, since their place on my plate by fish etcetera. I suspect I’m becoming a pescetarian. Growing up, first on the island of Taiwan, then on the West coast, sea salt is practically my mother tongue. Anything from the sea I find I love, in any way, shape, or form. This week, I was delighted by a beautiful wild sockeye filet. The front half had been masterfully transformed by my mother into a crisp-skinned deliciousness with braised salt plums, ginger, and scallions. The tail end, left to my care, I decided to cure. It’s simple, just follow the 1:1 ratio of fine sea salt and raw sugar, wrap it tightly in plastic wrap, and refrigerate for two to three days. I broiled it with the lightest kiss of sesame oil and a generous sprinkling of lemon juice to help crisp the skin. The left-overs I used in this fried rice, one that made me regret eating the salmon the night before as it has become obvious that I should have invested the whole piece to the fried rice. This fried rice features, of course, the luxurious salmon, but equally brings to attention to the saccharine crunch of Taiwanese cabbage, the earthy meatiness of oyster mushrooms. These do not compete, but each shines on its own while remaining humble and true to their fair part. As far as I’m concerned, the spirit of fried rice lies in its being lavishly humble. To make the fried rice, start by heating a wok until very hot. Add the oil, swirl it around quickly, then add the onion and saute until fragrant. Add the salmon, and saute until fragrant. Push the onion and salmon to one side of the wok and pour in the beaten egg. Let it brown slightly, then break it up with the spatula. Add the mushrooms and cabbage and season nicely, the salt will start to draw out the vegetables’ moisture, so keep stir-frying on high heat. Add the cold rice, corn, and white part of the scallion and stir well to warm combine evenly. I like little brown bits that stick to the bottom of the wok, so I usually stop stirring for a bit to let that happen before scraping it all up. Spoon into bowls or plates, or serve it fami-style. Garnish with the thinly sliced green part of the scallion. This keeps very well as leftovers if you cool it completely before storing in a sealed container and refrigerate. I myself have a weird preference of cold fried rice which my for which my mother makes fun of me, so I’d bring it as lunch, but it can just as well be microwaved before eating. 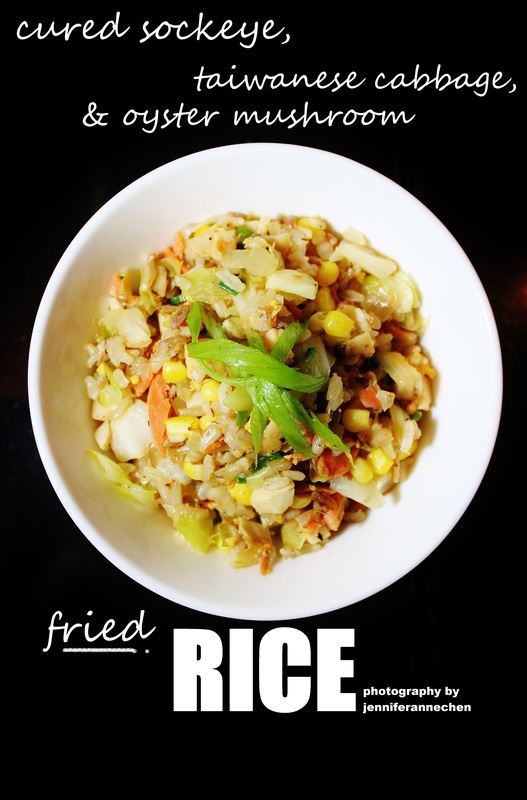 Remember, fried rice is supposed to be 100% as-you-like-it. Whatever you decide will be fantastic.